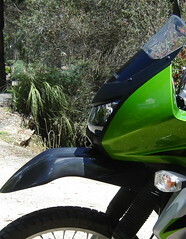 As much as I hate the look of it, the original buzzard beak is back on the KLR. I headed up to Mt Donna Buang from Healesville yesterday, and came home covered with crap. As you can see from the picture, most of the spray has come from directly in front, as though I was riding behind a car or another bike. In reality all that dirt is from the front tyre and the mudguard. I’d noticed before that water would flick out of the mudguard, get caught by the wind and flick straight back at the headlight… but this is just crazy. I know that Kawasaki did a lot of wind tunnel testing on the 08 model, and I’m starting to get the feeling they just kept making that mudguard longer and uglier until it did what they needed it to. The old one is back on now… next time I’m on the dirt I’ll post a photo of the results as a comparison. 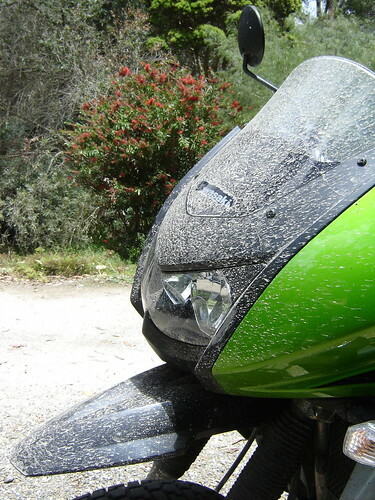 Speaking of dirt, I’ve been trying to get some nobbies for the KLR, and it’s proving difficult. The bike has a 17inch rear tyre, something that’s becoming a rarity on newer dirt bikes. I should have new tyres by the middle of the week, but no one in the area had them when I went looking on Friday. This would have to be the nearest thing to a clear liability I’ve seen in the KLR for a long-distance trip. I always figured that any replacement parts we needed along the way would have to be carted with us, or ordered in advance, but it seems that tyres are going to be that little bit harder to come by. It’s not a big thing… but I’m glad I found out about it now. There seems to be less to report of late, in terms of modifications to the bike etc. There’s still plenty to do, but a few of the upcoming mods will take both money and time. I have managed to get a few rides of different lengths in of late though, apart from the occasional commute to work. A few weeks back I spent some time riding along tight, twisty mown tracks in a paddock with my brother-in-law (on a KLX250) and my nephew (on a Suzuki 80). It was interesting to see how nimble the KLR could be on such a tight track, on grass, and on road tyres. It did OK, and kept pace with the 250 and the 80 with no dramas. I did manage to drop it a couple of times when the throttle completely overpowered the grip of the tyres. Looking forward to trying some different rubber. Tested out the luggage-hauling capacity of the bike the other week, too. I spent Melbourne Cup weekend camping with some friends, and decided to go by bike with my gear on the back. The Wolfman bag was great, and this time I added a tent and a camp chair to the ensemble. The bike handled the weight perfectly. That weekend confirmed to me that I’ll need a tank bag (for gadgets and ready-access stuff) and a tail box (for hard items such as tools and cooking gear) for proper touring, but that’s OK. On a group trip, where it’s more about the travel and less about comfort-camping, it wouldn’t be hard to be self-sufficient on bikes. Took a friend for a ride the other night. We started in evening sunshine as we left Healesville and headed to Don Valley. By the time we had ridden the Old Warburton Road it had started to turn a little colder, and the light was just starting to fade. We decided to head back via Mt Donna Buang, and about half way up we encountered some fog. Which then turned into pea-sop fog. We rode most of the trip over the mountain in 2nd gear, over bitumen and dirt. Fortunately we only encountered one vehicle coming the other way, though the driver hadn’t thought to put his headlights on. Anyway, we came out of the fog, and as we came down the mountain we saw a spectacular sunset… so it was all worth it in the end. I just seem to be rambling… I should stop.